Longitude swimwear by Robby Len is a brand of swimsuits specially designed with the tall woman in mind. All Longitude bathing suits are made in a long torso length, eliminating bottoms that rise and straps that tug at the shoulders. It's the perfect solution for tall women in need of a comfortable, perfect-fitting swimsuit. The Longitude brand of swimwear comes in a variety of sizes, from misses to plus size. The bathing suits can be found in a wide range of bold colors, striking patterns, and glamorous designs meant to accentuate your body. Some of the styles you'll come across are v-neck, high-neck, bandeau, and swimdress. These suits are fashionable and chic and have wonderful features that will ensure a great fit. Robby Len swimwear is a unique brand with a design that will flatter just about anyone. With all of the options, you're sure to find something to love. TALL TIP: Your biggest selection of long torso Longitude swimsuits will be at Swimsuits For All where they offer a number of styles on sale! JCPenney ($) Fashionable, classic-style clothing. 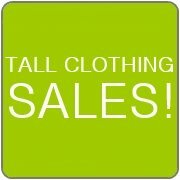 Carries jeans, pants, tops, sweaters, skirts, suits, jackets, activewear, sleepwear, and maternity in tall sizes. Also carries Longitude swimwear and other tall swimsuits styles. In the Swimsuits section, choose Longitude under the Brand menu or select Talls under the Size Range menu. Laraine's ($$) Carries the Longitude line of bathing suits made specifically for tall women. Offers a variety of colors and patterns in long torso one-piece styles. Swim Outlet ($$) Specialty swim shop. Offers a collection of ladies long torso fitness swimsuits. Select Women's Swimwear, then Fitness Swimwear, then Long Torso. Also carries the Longitude line of tall bathing suits. Select Longitude under the Shop By Brand drop-down menu. Longitude ($$) Specialty swim shop. Carries the Longitude line of bathing suits made specifically for tall women including one-piece, swimdress, shortini, skirtini, and tankini swimwear. Large selection of long torso swimsuits in a variety of prints and patterns from size 8 to 24W. Can talk with a swimwear specialist for style recommendations. Swimsuits Just For Us ($$) Plus size swimsuits. Carries a selection of Longitude long torso one-piece bathing suits made specifically for tall ladies in up to size 24W.